Official CyanogenMod 12.1 (CM12.1) ROM is now available for Xiaomi Mi4 and Mi3 android phone users. The new official ROM is based on the Android 5.1.1 (Lollipop), which is designed to increase performance and reliability over stock Android for your device. CM12.1 is one of the most famous ROM and comes with lots of features and customizations. We recently install the CM 12.1 on our Mi 3 phone and we are really impressed with the performance of the ROM and one of the best thing we like about the ROM is that it comes with lots of useful features which you can’t find on your MIUI ROM. 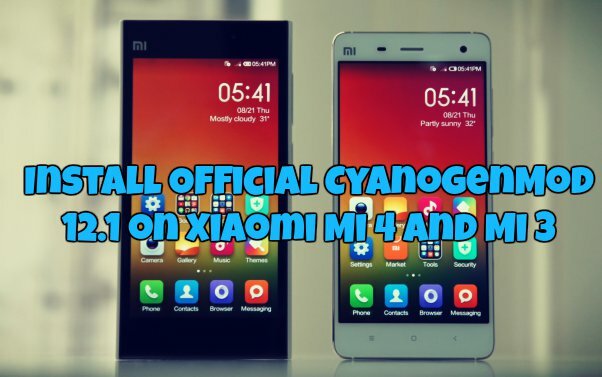 If you are the owner of Xiaomi Mi4 and Mi3 phone and want to test the latest official CyanogenMod 12.1 on your phone. Here is the tutorial which you can follow on your phone and install the same in simple steps. To get started all you need a custom recovery to flash two zip file on your phone. Before following this tutorial do take the full backup of your Xiaomi phone and save the backup file in some safe place. Read all the steps carefully and follow them one by one on your Xiaomi Mi4 and Mi3 phone. Step 1. First download the TWRP recovery here on your phone and Go to Setting>Updater or Open Updater App from home screen. From here Press menu button and then “Select update package”. Select the recovery zip and install it. Reboot device. If you already done this then follow the Step 2. Step 2. Download the CM 12.1 ROM for Mi 3 and Mi4 here and save it on your desktop. Don’t extract the folder on your desktop. Step 3. Now download Google Apps package zip file here and save the zip file on your desktop. Step 4. Now move both the downloaded file on your phone and remember the location of the files. Step 6. Now from the recovery menu, Select ‘Wipe’ > Advanced > select Wipe data & cache and confirm. Step 7. Go back and select ‘Install’. Select the CM 12.1 ROM File and Flash it. Step 8. Once the flashing process is done again select the Google apps package. Step 9. Now go back Reboot your phone by selecting ‘reboot system now’. That’s it! Now your MI 3 and Mi 4 phone is running on the CyanogenMod 12.1 Android 5.1.1 ROM.